Coral reef ecosystems support important commercial, recreational, and subsistence fishery resources in the U.S and its territories. Fishing also plays a central social and cultural role in many island and coastal communities, where it is often a critical source of food and income. The impacts from unsustainable fishing on coral reef areas can lead to the depletion of key reef species in many locations. Such losses often have a ripple effect, not just on the coral reef ecosystems themselves, but also on the local economies that depend on them. 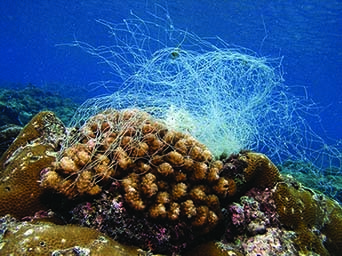 Additionally, certain types of fishing gear can inflict serious physical damage to coral reefs, seagrass beds, and other important marine habitats. Coral reef fisheries, though often relatively small in scale, may have disproportionately large impacts on the ecosystem if conducted unsustainably. Rapid human population growth, increased demand, use of more efficient fishery technologies, and inadequate management and enforcement have led to the depletion of key reef species and habitat damage in many locations. Minimizing negative fishing impacts is critical to revitalizing and protecting coral reef resources for current and future generations. Given the many entities with jurisdiction over U.S. coral reef resources, cooperation among partners is essential. 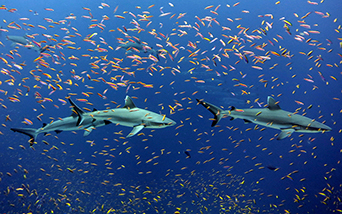 The NOAA Coral Reef Conservation Program works with partners to increase the abundance and average size of key reef fishery species. We also develop products and tools to support the creation and management of marine protected areas, improve compliance with management regulations, and increase public understanding of fishing impacts on coral reefs.